Worldbank is currently financing a project on improvements for the sanitation of Kabul. 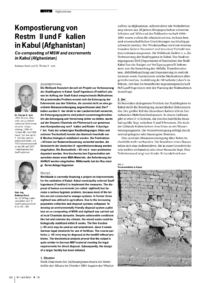 Kabul municipality ordered Gauff Ingenieure (Frankfurt) to implement the measures. The disposal of human excrements (so called: nightsoil) has become a serious hygienic problem, because most of the toilets are not connected to sewage systems. In former times nightsoil was utilized in agriculture. Due to the increasing population collection and disposal systems collapsed. To develop an environmentally friendly disposal system a pilot test on co-composting of MSW and nightsoil was carried out at local Chamtala dumpsite. Despite unfavorable conditions like hot and extreme dry climate, the mixed waste could be biologically stabilized within 8 weeks. The fine fraction (< 40 mm) may be used as soil amendment, since it meets German legal standards for use of fertilizer. The coarse particles (> 40 mm) may be disposed at the landfill without problems. The biochemical analysis proved that the output is quite similar to German MBT-material meeting the legal require ments for direct disposal. Subsequently, the design of a larger facility has been initiated.